Pinterest is a social media application that is a digital pinboard (bulletin board), which can be used to find or organize digital information visually. Pinterest enables you to find and organize information, pictures, ideas, how-tos, resources, or whatever you find interesting. You can even upload your personal pics or files. Learn more about Using Pinterest as a Sewing Resource. 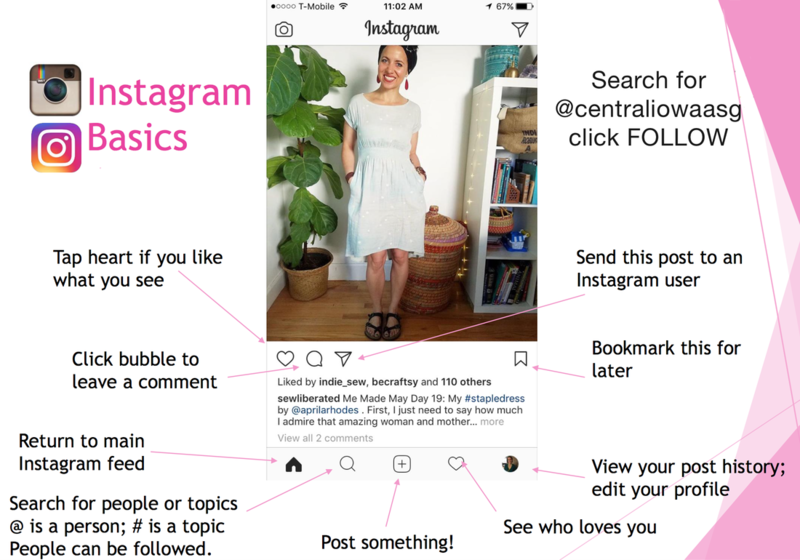 Instagram is a fantastic way to research sewing patterns to see how they fit on many body types, and get inspiring pattern modification ideas. It is a free app found in the Google Play Store or in the Apple App Store. Most indie pattern designers are sharing their work on Instagram and they love to see how sewists put their own personal spin on a design. Search Instagram for your favorite designers, fabric companies, and fabric stores. Click the follow button and you'll be rewarded with a scrolling photo gallery of patterns available now, designs in development, upcoming fabric lines, store sales and deals, plus much more. You can search for a topic by using the # sign. A pattern may have a suggested hashtag printed on it, but if not, a quick search with the pattern name will usually find it. Inspiring photos can be bookmarked for later. Central Iowa ASG can be found by searching @centraliowaasg. Follow for information on upcoming meetings topics, news from neighborhood groups, and photos from guild meetings and members. Encourage potential guild members to follow us and see what we're about!